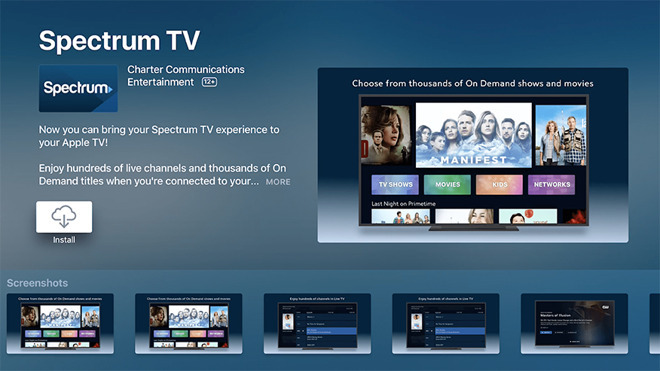 Having missed an original 2018 deadline, Charter Spectrum on Thursday finally released its promised Apple TV app with support for tvOS 12's "zero sign-on" functions. The Spectrum TV app lets users watch any channel or on-demand title associated with their TV bundle. Zero sign-on authenticates subscriptions in the app automatically, but only if a customer also has a Spectrum internet plan. Until tvOS 12 the most the Apple TV offered was single sign-on, letting people enter their TV credentials once and have them pass to any app with the same compatibility. Not all apps support the feature, and some providers may not be compatible across the board, but the addition was a welcome change from having to repeatedly enter the same login. Apple all but confirmed that the Spectrum app would miss 2018 in mid-December, when it changed marketing language from "later this year" to "coming soon." Around the same time early signs of zero sign-on appeared. While Spectrum is a U.S.-based company, other providers enabling the Apple TV as a cable/satellite box replacement include France's Canal and Switzerland's Salt. So if I’m not in spectrum’s normal service footprint can you still sign up for service with them & just use this app? So from big cable, Streaming service providers, who is still not on Apple-TV single sign on bandwagon. Not 1005 sure but typically you have to be on the same Internet connection/package from Comcast/Spectrum to take advantage of it. No go. Spoke to Spectrum and you need to be on their internet service to use app. So you have to be in the spectrum footprint. More life support for cable companies. Wireless will take them down in the end along with their channel packaging, forced local channels and a bunch of crap you do not want. No. You must must at least subscribe to Spectrum TV and Internet. The zero sign-on uses your Spectrum internet connection to authenticate. You can skip the phone service if you don't want it. You don't have to pay extra for Spectrum's WiFi, you can setup an AirPort Extreme for example or equivalent WiFi as a pass-thru and connect it to the Spectrum Router and put all your AppleTVs and computers on the Airport. Well, I have had a chance to use the AppleTV Spectrum app at someone else's home and I am very impressed. I find the Spectrum UI to be easier to use and more responsive than my DirecTV Now and it provides the same functions except perhaps for a DVR option. Switching stations on the Spectrum App is also visibly faster than my DirecTV Now possibly because it is on the Spectrum Network. Moreover, we were running 3 AppleTV and there does not appear to be a restriction on the number of simultaneous streams. So the only advantage DirecTV now offers is that it works on any network including cell networks but it is restricted to 2 streams or 3 streams for an extra fee but cannot support zero-sign-on. Perhaps DirecTV Now may change when AT&T 5G becomes available to support zero sign-on. In any case, these monolithic apps show that there is plenty of room for improvements in tvOS and Apple can help. First and foremost, people what to turn on their AppleTV and use SIRI go directly to any live network or on-demand content in their subscription. The monolithic Apps like the Spectrum App or DirecTV Now do not allow this. Even the smaller network specific apps do not switch directly to their live TV stream for your specific region. When you use the network browser in these monolithic apps you can appreciate the complexity of the different streams and on-demand content that exist for different regions for each specific network. You can always use the “Guide” to go directly to your regional live stream but scrolling through the alphabetically listed guide to find a specific network can be cumbersome although the guide is useful for show what is currently playing or is scheduled on the different networks. 1. Apple should support SIRI shortcuts on the tvOS for all Apps. 2. Apple should define a common protocol to be supported by the monolithic cable provider apps and/or network specific apps to allow SIRI to switch to live streams or on-demand content from various content providers by name. 3. Apple should provide a common Guide app that can browse guide data from any Cable TVprovider. Overall this Spectrum TV app is a very big win for the AppleTV platform in the States. For AT&T’s sake, I hope DirecTV Now can support zero sign-on over 5G and allow more streams soon because I imagine AT&T will lose a lot of customers if local cable providers decide to support zero sign-on with their respective tvOS apps. Any off chance this would be made available on the 3rd gen Apple TV? No because because the 3rd gen and earlier models run a different operating system and not the new tvOS. That's a shame. I keep seeing new "channels" or apps show up on my 3rd gen so I thought maybe they do it. Just haven't made that jump to a current gen Apple TV yet. It's hard because they only things I really use a device like that for are streaming Netflix, Amazon Prime and the occasional other channel like ABC, etc to watch previously aired episodes of stuff. And while it's not nearly as elegant, a Roku stick does all that quite well for me for around $30 vs $150+ for the Apple TV. Just can't justify that big of a difference. Interestingly enough, Spectrum is trying an "a la carte" option; I'm trialing it right now (so far, so good). Spectrum doesn't do a good job of telling people about this; I only learned of the option upon calling to cancel the Cable + Phone part of my service in favor of just Internet (was going to use Hulu Live for TV). If your friend has other Networks apps (AMC, etc) is he able to log into those apps and view content as well? I ask because we currently have AT&T U-verse. I'm constantly getting rejection messages that say "your current subscription does not provide access to this content, blablabla." We then will log in with a family members Xfinity account and we are able to get everything. Frustrating, especially since i have one of the higher tier of channel counts with U-verse. I'm assuming it wouldn't matter as much since it would be consolidated all in the Spectrum App, but some of those apps offer additional content, seasons, etc. Were you able to see any live TV? Was it good quality? Thanks!